eD@HoMe: Lovely covers from Slovakia and India! Ahoj! (Hi!) Many thanks to Robert Brnka for sending this lovely cover from Trnava, Slovakia! 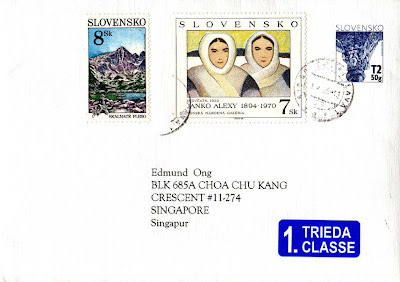 The stamp franked on the left of this cover belongs to the "Tatra Mountains" series. It was issued in 2001. The Tatra Mountains constitute a mountain range which forms a natural border between Slovakia and Poland. 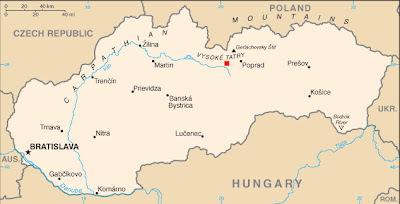 They occupy an area of 750 km², the major part (600 km²) of which lies in Slovakia. The highest mountain is Gerlach at 2,655 m, located in Slovakia just north of Poprad. The north-western peak of Rysy (2,499 m) is the highest Polish mountain. The Tatra Mountains are extremely popular for tourists both in the summer and winter. In summer, visitors enjoy the mountain scenary and relatively cool weather. In winter, skiing and ski jumping are primary activities. Both domestic and foreign tourism have grown rapidly since Poland and Slovakia gained independence and joined the European Union. 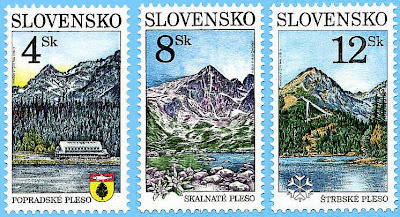 The three beautiful stamps in this set depict Popradské Pleso (4 Sk), Skalnaté Pleso (8 Sk) & Strbské Pleso (12 Sk). Next, is a stamp from the "Art" series, issued on 15th Dec 1994. 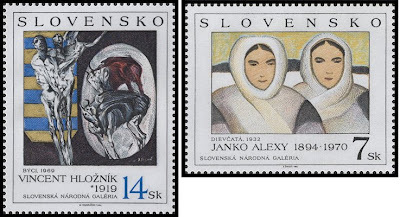 The set of two stamps features famous works titled "Bulls" & "Girls" by great Slovak artists, Vincent Hložník (1919-1997) & Janko Alexy (1894-1970) respectively. Franked on the right of the cover is a pre-printed stamp inscribed "T2 50 g", which corresponds to the postage for a second class letter up to 50 grammes in the domestic service. The second cover for today was sent by Shrikant Modh from Gujarat, India. Thank you very much! The stamp franked on the left of this lovely cover was issued on 21th Dec 2008 to commemorate the 100th birth anniversary of T. V. Ramasubbaiyer. 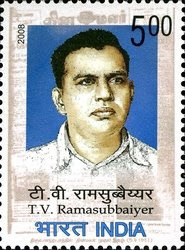 Thazhuvia Ramasubbaiyer (October 2, 1908 – July 21, 1984) (popularly referred to as TVR) was an Indian freedom fighter, philanthropist and founder of the popular Tamil daily newspaper Dina Malar. Lastly, is a set of 3 colourful stamps from the "Children's Day" series, issued on 14th Nov 2008. 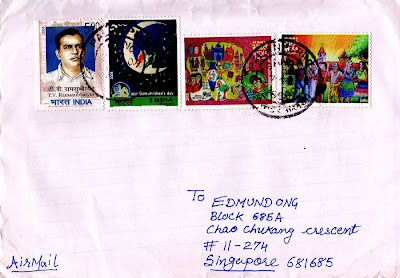 This cover was postmarked on 27th April 2009 and took 15 days to travel an estimated distance of 4,305kms.